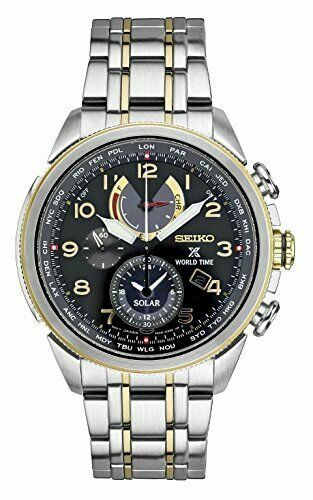 eBay Seiko Men's Prospex World Time Solar Chronograph Silvertone Watch This impressive men's watch from Seiko's prestigious Prospex collection keeps you on time and in style no matter where your adventures take you. This is a Factory Seconds but Looks Brand New and comes with all Original Paperwork and Warranty.FEATURES Factory Seconds But looks and Feels New Please email for Pictures ! Date windowDaily alarm12/24-hour formatsWorld time: 25 citiesChronograph: elapsed & split times; 1/5-second increments for up to 24 hoursPower reserve: 6 monthsPower reserve indicatorDISPLAYDial color: blackLuminescence: LumiBrite hands & hour markersFace cover material: sapphire crystalCASEMaterial: stainless steel with gold-tone accentsDiameter: 42 mmBANDMaterial: silver- & gold-tone stainless steelClasp: fold-over, push-button deploymentCircumference: 215 mmWidth: 22 mmDETAILSMovement: quartzPower: solarWater resistance: 100 metersFull Seiko Warranty Included Welcome to ShopEmco! We thank you for stopping by, and look forward to servicing you by providing you with the best possible customer care. Shipping on most orders are within 24 hours. We are happy to ship to all International destinations provided the manufacture does not restrict us to do so.We are happy to ship orders to all international destinations. Please note we are not responsible for customs and duty fees. Fees may be collected at delivery by your local carrier depending on the policies of every individual country these fees are determined by your Country and we are unable to provide this information.